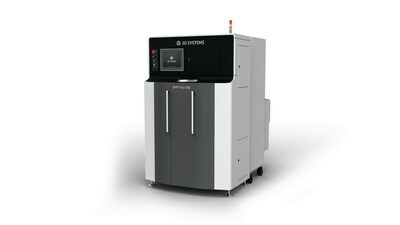 ROCK HILL, S.C., June 5, 2018 — (PRNewswire) — 3D Systems (NYSE: DDD) today launched the new DMP Flex 100 and DMP Dental 100 3D printers, introducing superior quality, versatility and throughput for entry-level metal 3D printing and dental applications. Designed to be used flexibly for R&D, application development and production, the DMP Flex 100 provides up to twice the throughput compared to 3D Systems' previous entry-level metal 3D printer, the ProX DMP 100. It produces precision metal parts with complex fine details and thin walls – achieving superior accuracy, repeatability and surface finish as fine as Ra 5 μm. Its build volume of 100 x 100 x 80 mm (3.94 x 3.94 x 3.15 in) is ideal for small, intricate parts. The DMP Flex 100 is equipped with enough power to process a material spectrum that includes different grades of Titanium as well as other alloys. At launch, 3D Systems is offering LaserForm® CoCr (B) and LaserForm 17-4PH (B) with extensively developed, tested and optimized print databases. Additional LaserForm materials for use with the DMP Flex 100 are in development. 3DXpert™, 3D Systems' all-in-one software solution for Design for Additive Manufacturing (DfAM), is included with the DMP Flex 100 to ensure a streamlined and repeatable process for high quality optimized prints. 3D Systems is also addressing the unique requirements of dental labs with the new DMP Dental 100 metal 3D printer. This entry-level solution is designed for a maximum price/performance ratio - producing high-quality, metal dental prostheses in a business-boosting digital workflow. For example, the DMP Dental 100 can print up to 90 crown copings in less than four hours in a single print run, with only 25 minutes required for heat treatment*. Outstanding surface quality means minimal post-processing is required and a typical print accuracy of 50-microns ensures an exceptional fit for crown copings, bridges, suprastructures as well as for partial frames. To streamline the digital dentistry workflow, the DMP Dental 100 printer comes with LaserForm CoCr (C) material (ISO 13485, ISO 9001, FDA and CE qualified) and includes a high-performance 3D Systems software solution for managing the manufacture of fixed and removable dental prostheses. 3D Systems believes the resulting accelerated throughput of the DMP Dental 100 will give dental labs a competitive edge for quick turnaround jobs and more flexibility to respond to customer orders. "3D Systems is demonstrating its commitment to bringing industrial-grade metal additive manufacturing to a wider customer base with the launch of the DMP Flex 100 and DMP Dental 100 metal 3D printers," said Kevin McAlea, EVP metals and healthcare, 3D Systems. "Both solutions feature levels of throughput, print quality, ease of use and material choice that put them in a class by themselves. We believe these 3D printing solutions will further expand the adoption of metal additive manufacturing by designers and engineers, researchers, manufacturers and dental professionals." Both the DMP Flex 100 and DMP Dental 100 metal 3D printers are available immediately. *Based on internal 3D Systems testing. 3D Systems is the originator of 3D printing and an innovator of future 3D solutions. It has spent its 30-year history enabling professionals and companies to optimize their designs, transform their workflows, bring groundbreaking products to market and drive new business models. This is achieved with the Company's best of breed digital manufacturing ecosystem. It's comprised of plastic and metal 3D printers, print materials, on demand manufacturing services and end-to-end manufacturing software solutions. Combinations of these products and services address a variety of advanced applications - ranging from Aerospace, Automotive, and Consumer Goods to Medical, Dental, and Jewelry. For example, 3D Systems' precision healthcare capabilities include simulation, Virtual Surgical Planning, and printing of medical and dental devices as well as patient-specific surgical instruments. More information on the company is available at www.3dsystems.com.